This property in London N6 had been rented out previously by the owners and they were now renovating it before moving back in, this work included a wet room which had glass mosaic floor tiles and a dark Basalt tile laid on the wall. The main problem had been a general lack of maintenance over the years which led to a major unsightly build-up of lime scale throughout the wet room. We agreed to do the work but had to explain to the client how difficult the work would be and set their expectation for only an eighty percent improvement. I must apologise in advance for the quality of some of the photographs on this page, the size of the room, low lighting a nature of the stone surfaces didn’t lend themselves well to being photographed. Having protected all the chrome furnishings within the wet room we started to soak the Basalt tiled walls with Tile Doctor Grout Clean-Up followed by scrubbing and rinsing constantly with clear water. Grout Clean-up is an Acid based product so you do need to take care when doing this however it is particularly effective at shifting mineral deposits like Limescale. When we were satisfied this had removed the majority of soap scum and lime scale we proceeded to clean the Glass Mosaic floor tiles using the same method. The basalt tiled walls now needed to be restored back to their original factory condition using small diamond encrusted burnishing pads attached to a hand held polishing machine. We started with a coarse pad which removed any remaining Limescale which had impregnated the surface of the stone and moved onto the finer pads which polish the stone. 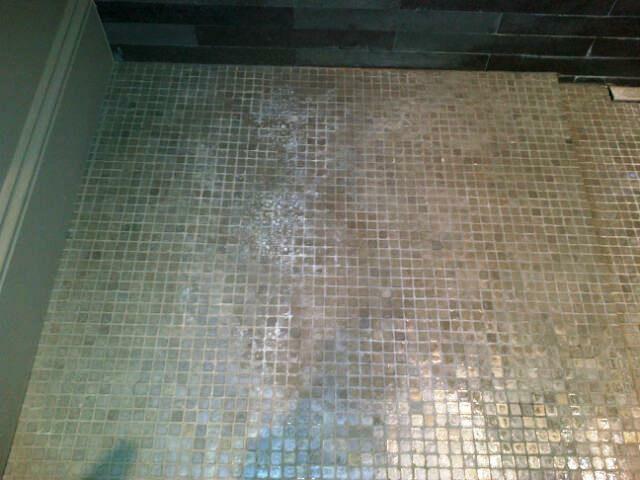 Once this was complete the tiles were given a final clean with Tile Doctor Neutral Cleaner which is an everyday cleaning product designed for regular use on stone or sealed tiled surfaces. We came back on the third day and after making sure the Basalt tiles had dried we gave it a final buffing to restore the stone to a deep high gloss shine. The last step was to seal the Basalt tile in order to protect it and make it easier to clean in the future and for this we applied three coats of Tile Doctor Colour Grow which is an impregnating sealer that soaks into the pores of the stone. 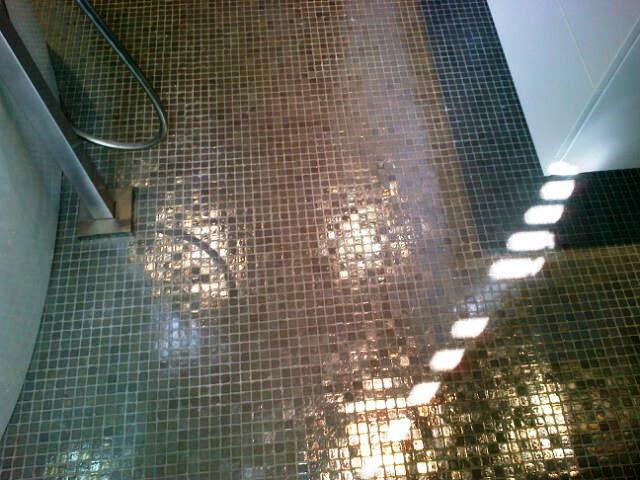 Finally we used a rotary floor polisher fitted with a white buffing pad to buff the mosaic glass floor to a high shine. 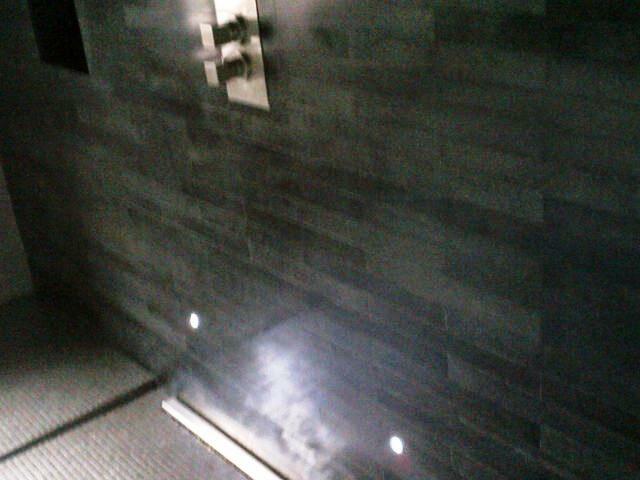 This entry was posted in Stone Sealing Products, Tile and Stone Problem Solvers, Tile Cleaning Products and tagged basalt tiles, cleaning services, glass mosaic tiles, london n6, restoration, sealing, south buckinghamshire, tile cleaning, tiled floor, wet room by AbzDominise. Bookmark the permalink. 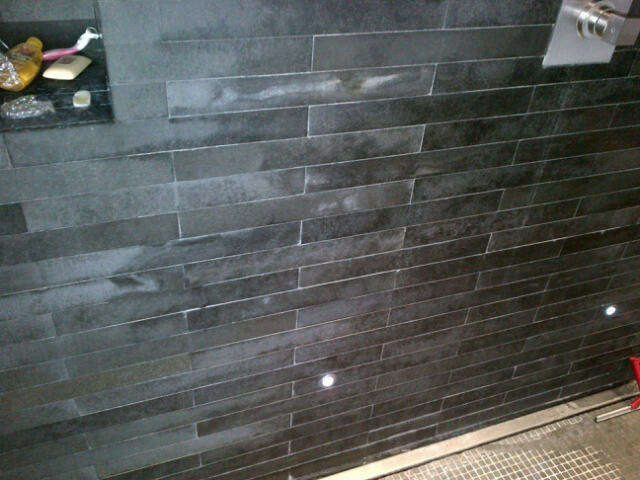 Great looking floor, the wet room tiles look much better for your efforts.